Spotnails W1S4840 1/4 Crown x 18 gauge Narrow Crown Stapler Kit. Drives 1/2 to 1-5/8 inch long staples. Kit includes Plastic Carrying Case, Safety Glasses, Tool Oil, Manual. Price/Each. Shipment to Credit Card Billing Address only. Signature by cardholder on delivery required (with Photo ID). 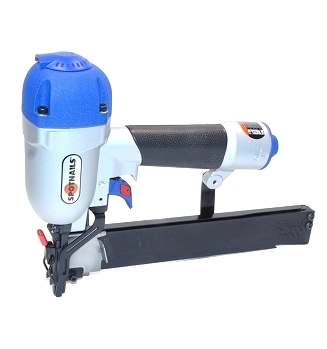 Spotnails W1S4840 High Quality Narrow Crown Pneumatic Stapler. Common applications include: Cabinet Assembly, Door & Window Manufacturing, Drawer Assembly, Floor Underlayment, Furniture Assembly, Roofing Underlayment. L10SS L-Series Narrow Crown Staples, 5/8 inch Leg X 1/4 inch Crown, Senco Type, Chisel Point, 18 Gauge 304 Stainless Steel. 5000/Box. Price/Box. L11SS L-Series Narrow Crown Staples, 3/4 inch Leg X 1/4 inch Crown, Senco Type, Chisel Point, 18 Gauge 304 Stainless Steel. 5000/Box. Price/Box. L12SS L-Series Narrow Crown Staples, 7/8 inch Leg X 1/4 inch Crown, Senco Type, Chisel Point, 18 Gauge 304 Stainless Steel. 5000/Box. Price/Box. L13, NARROW CROWN L-SERIES COLLATED STAPLES, 1 in. LEG X 1/4 in. CROWN, 18 GAUGE, GALVANIZED STEEL. BOX OF 5,000. PRICE/BOX. L14, NARROW CROWN L-SERIES COLLATED STAPLES, 1-1/8 in. LEG X 1/4 in. CROWN, 18 GAUGE, GALVANIZED STEEL. BOX OF 5,000. PRICE/BOX. L15, NARROW CROWN L-SERIES COLLATED STAPLES, 1-1/4 in. LEG X 1/4 in. CROWN, 18 GAUGE, GALVANIZED STEEL. BOX OF 5,000. PRICE/BOX. L16, NARROW CROWN L-SERIES COLLATED STAPLES, 1-3/8 in. LEG X 1/4 in. CROWN, 18 GAUGE, GALVANIZED STEEL. BOX OF 5,000. PRICE/BOX. L17, NARROW CROWN L-SERIES COLLATED STAPLES, 1-1/2 in. LEG X 1/4 in. CROWN, 18 GAUGE, GALVANIZED STEEL. BOX OF 5,000. PRICE/BOX. L17SS L-Series Narrow Crown Staples, 1-1/2 inch Leg X 1/4 inch Crown, Senco Type, Chisel Point, 18 Gauge 304 Stainless Steel. 5000/Box. Price/Box.